Peak Tailing is something that every chromatographer faces yet its adverse impact is usually underestimated and not properly perceived. A useful discussion with advices regarding peak tailing is found in Restek's ChromaBlography website. Largely reduced peak height and signal, far more than could be guessed from the slightly deteriorated tailing peak shape. As shown in the figure above, slight peak tailing results in about six times loss of peak height. Increased noise. The lost signal is converted into a long (and in many cases very long) tail that is transformed into noise as can be seen in many RSIM traces after the elution of a tailing peak. Increased RSD. The analysis reproducibility is adversely affected and the RSD is significantly increased even due to a slightly tailing peak. Sample identification via library search is adversely affected by peak tailing and particularly from the increase of ion source temperature that is needed to reduce the peak tailing. While the peak tailing can be reduced via the increase of the ion source temperature such temperature increase exponentially reduces the relative abundance of the molecular ion, reduce the sensitivity in RSIM on the molecular ions and increases the chances of sample degradation at the ion source. A few classes of compounds such as free fatty acids require laborious derivatization for their GC-MS analysis as otherwise their analysis becomes impractical, and these derivatization procedures aren't always practical themselves. 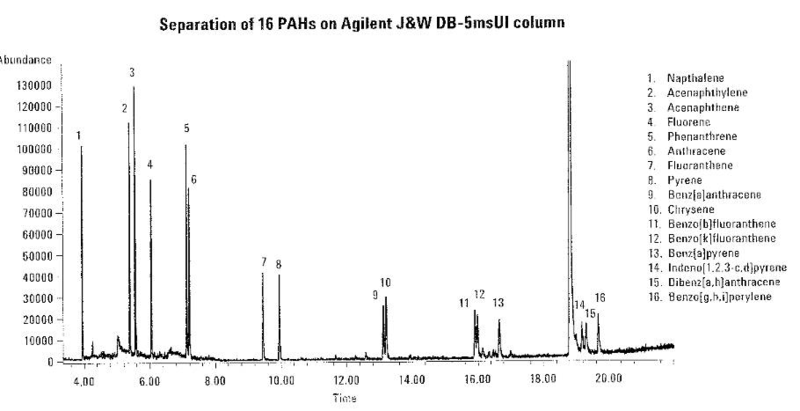 Keep reading to find out how the Aviv Analytical 5975-SMB GC-MS with Cold EI helps in the complete removal of ion source peak tailing and degradation while providing enhanced molecular ions and superior signal to noise ratio particularly for polar and difficult to analyze compounds. Among the GC detectors the mass spectrometer is unique in that its EI ion source temperature is typically lower than the GC oven and sample elution temperatures. The reasons for this relatively low ion source temperature are to suppress ion source degradation, enhance the molecular ions in EI mass spectra and improve the library identification, since the libraries include EI mass spectra that were mostly obtained at low ion source temperatures to improve their quality. Consequently, a sample that elutes at 300ºC GC oven temperature is placed inside the EI ion source with its metallic plates that is typically at 230ºC and the sample starts to experience several lengthy cycles of adsorption and thermal desorption from the cool ion source metal plates that manifest itself as peak tailing. In order to maximize the signal, standard EI ion sources are designed and produced with tiny openings for the electron beam, column and ion exit lens in order to maximize the number of sample crossing trajectories at the active electron ionization volume. 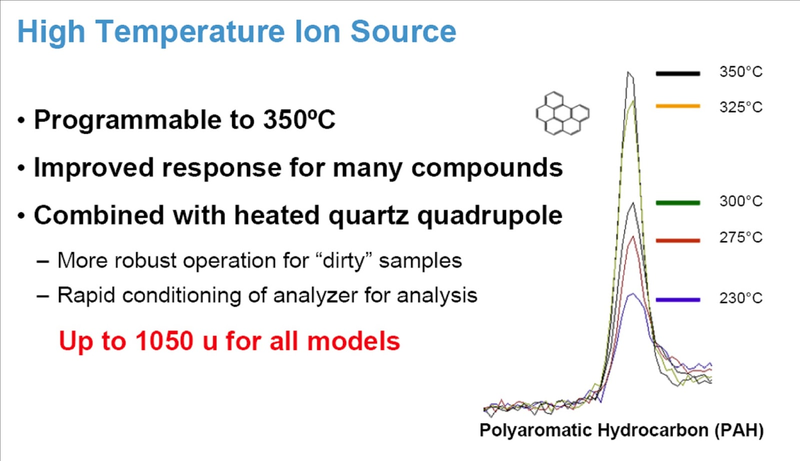 We estimate that about 50 intra ion source adsorption desorption cycles are encountered until the sample compounds find their way out of the ion source. Thus, the desire to increase the ionization efficiency actually leads to more pronounced ion source peak tailing, which is further exacerbated by the fact that the ion source surfaces are metallic as they must be electrically conductive despite the fact that metals are known to be effective catalysts of chemical degradation of organic compounds. In addition, the ion source temperature is not uniform and its complex structure results in the fact that the peak tailing is often characterized by a multi exponential decay with a very long and shallow tail. Naturally, ion source peak tailing is far more pronounced with low volatility, thermally labile and polar compounds that are characterized by strong interactions with the ion source metal surfaces. In Figure 1 ion source peak tailing is demonstrated via the ion source temperature effect on the mass chromatograms and mass spectra of a mixture of the indicated linear chain alkanes n-C12H26 up to n-C40H82. 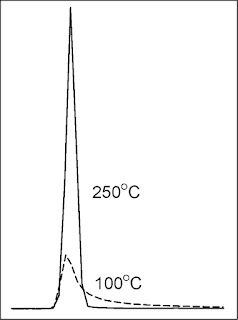 As demonstrated, the increase of the ion source temperature from 100ºC all the way to 250ºC induces peak height increase already from C20H42 and the effect of ion source temperature is significant and can approach an order of magnitude peak height increase per 100ºC ion source temperature increase. Figure 1. Ion source peak tailing. 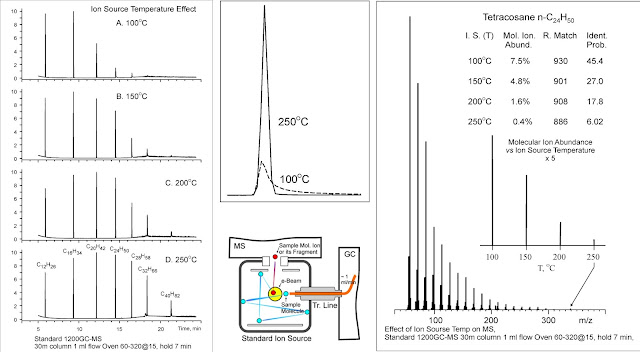 The effect of ion source temperature on the total ion mass chromatograms is shown at the left side while at the right side we show the effect of ion source temperature on the reduction of the molecular ion abundance. The upper middle portion of the figure shows the effect of peak tailing with n-C24H50 and its significant manifestation on peak height reduction. The middle bottom portion of Figure 1 shows some potential trajectories of the sample molecules at the ion source in which each can involve adsorption and desorption from the metallic surface of the ion source. It is estimated that about 50 such adsorption desorption cycles are possible until the sample compounds finds their way out of the ion source. Click to Enlarge. 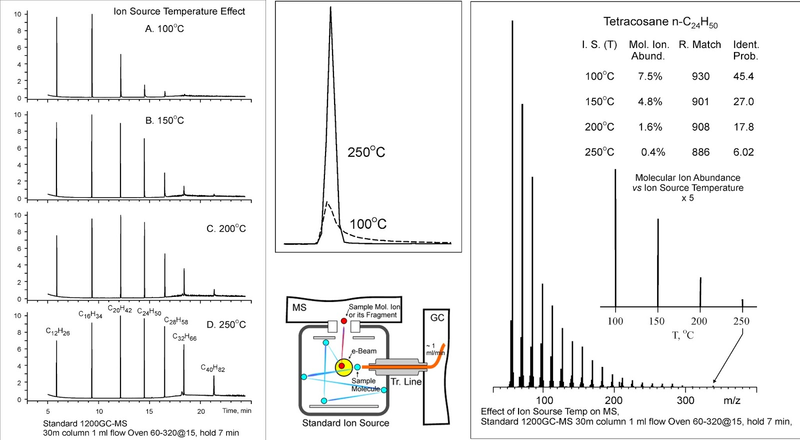 In the upper middle insert figure we show the effect of ion source peak tailing on n-C24H50 in which the change of temperature from 100ºC to 250ºC increases the peak height by about a factor of six. 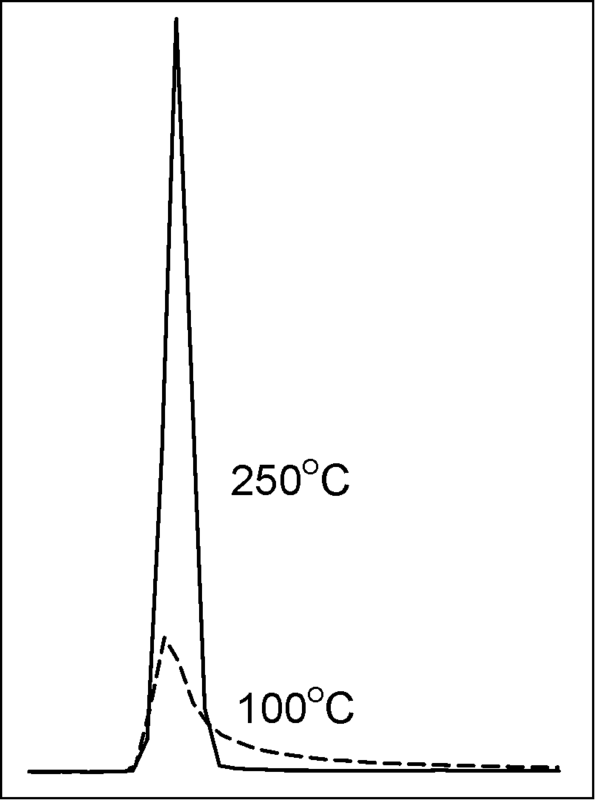 At 100ºC the peak shows a "small" tail but like an iceberg this small tail hides a factor of six reduced peak height which is not easily recognizable via the peak shape. Accordingly, increased ion source temperature alleviates the problem of ion source peak tailing. However, as demonstrated at the right side of figure 1 the penalty is in exponential reduction of the relative abundance of the molecular ions and for n-C24H50 it is going from 7.5% at 100ºC to 0.4% at 250ºC which is a factor of close to 20 per 150ºC. In addition, the NIST library identification probabilities are reduced with the increase of the ion source temperature from 45.4% to 6.02% and already at 200ºC with 17.8% identification probability the correct compound is not number 1 in the NIST library hit list and therefore cannot be properly identified. In addition, peak tailing increases the analysis RSD. The reasons for this are that it depends on the exact ion source temperature as well as on the ion source surface cleanliness which changes over time. For example, the sample in the first analysis after a few hours or days of idle time finds a clean ion source surface while the next sample will find different surface cleanliness conditions hence the degree of tailing could change from analysis to analysis. In summary, the ion source temperature should be high enough to prevent ion source related peak tailing, however, increased ion source temperature results in higher internal energy of the molecule and thus lower molecular ion abundance. Consequently, in standard GC-MS there is a basic conflict between peak tailing and molecular ion abundance. As shown below, this conflict is fully resolved when a GC-MS with Cold EI is used. Figure 2. 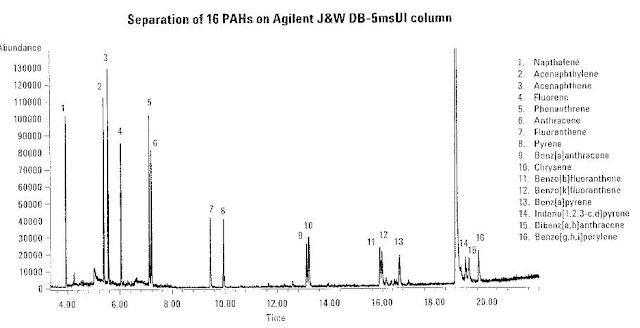 From Agilent App Note 5990-6668, 0.5 ng each PAH compound on-column at 340ºC ion source temperature. As shown and as is well known, ion source peak tailing results in reduced peak heights for the lower volatility compounds by up to (and even more than) an order of magnitude. In this case even at a very high ion source temperature of 340ºC this effect prevails. In addition, the peak tailing erodes the chromatographic separation which is worse for the pair of compounds 14 and 15 versus 5 and 6. Click to Enlarge. Figure 3. 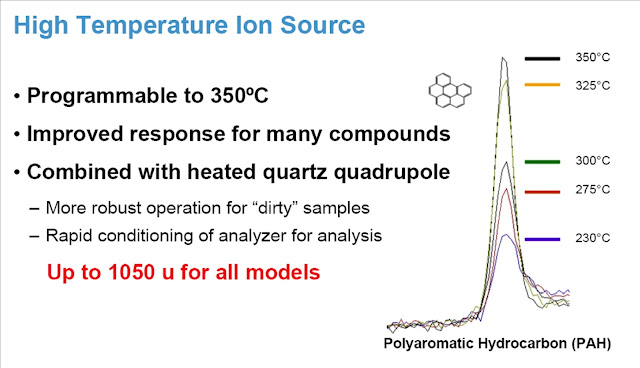 From Agilent public eSeminar GC-MS presentation (slide 70). Ion source peak tailing reduction via the increase of ion source temperature. As demonstrated, the increase of the ion source temperature from 230ºC to 350ºC triples the peak height for the indicated six rings PAH but as clearly observed the tail at the right side remains even at this maximum ion source temperature. Click to Enlarge. Other known classes of compounds that tail at the ion source are the polar and labile compounds such as polar pesticides, free organic acids and even organic alcohols. 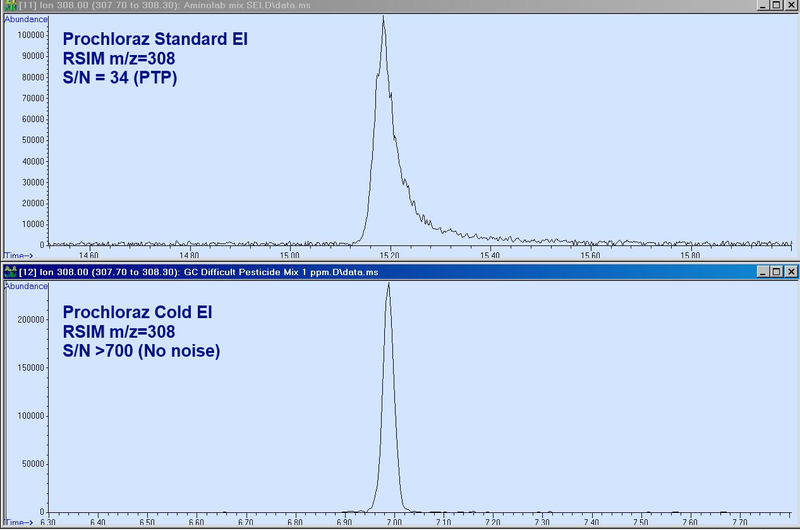 Among the tailing polar compounds several pesticides are known to tail at the ion source and one of them is Prochloraz as demonstrated in Figure 4 while another example is cholesterol (Figure 6) that not only tails at the ion source but also partially decomposes into cholestane. The best way to eliminate ion source peak tailing is to have a contact-free ion source in which the sample compounds do not scatter from the ion source surfaces. The Aviv Analytical 5975-SMB GC-MS with Cold EI system is based on a combination of an Agilent 5975 MSD with the Aviv Analytical supersonic molecular beam interface and its unique fly-through ion source (GC-MS with Cold EI). In this type of GC-MS ion source peak tailing is fully and inherently eliminated since the sample at the molecular beam flies through the ion source without any contact with its inner surface. In addition, the molecules are ionized by electrons while they are vibrationaly cold (via the supersonic expansion) hence the name Cold EI. As a result, the Cold EI mass spectra are characterized by having enhanced molecular ions. Figure 4. Prochloraz analysis by standard Shimadzu QP 2010 Plus GC-MS (upper trace) and 5975-SMB GC-MS with Cold EI (bottom trace). Prochlorz C15H16Cl3N3O2 is a polar pesticide thus it is known to exhibit ion source peak tailing and as a result it is considered as a difficult to analyze pesticide. In this figure we show the RSIM (reconstructed single ion monitoring mass chromatogram) on a prochloraz high mass fragment of m/z=308 since the molecular ion m/z= 375 is observed only with Cold EI. Click to Enlarge. Figure 5. Peak tailing and intra ion source degradation of Cholesterol. Cholesterol was analyzed by standard Agilent GC-MS (upper trace) and GC-MS with Cold EI (bottom trace). 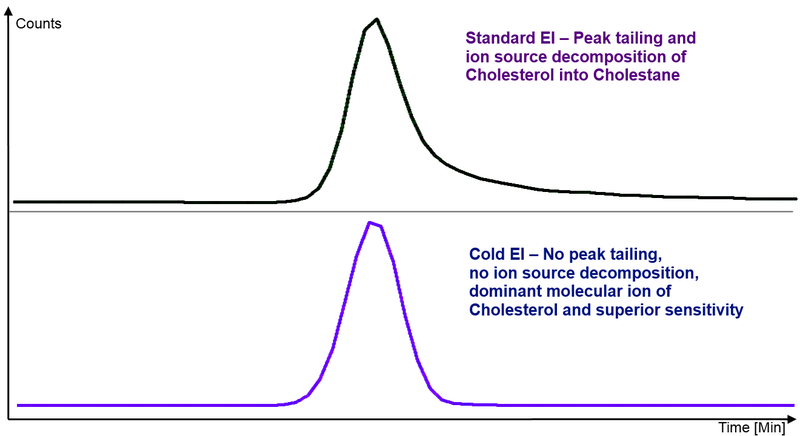 Clearly, Cold EI provides a clean and symmetric peak shape and the Cold EI mass spectrum is characterized by having a dominant molecular ion at m/z=386.4, and only 20% abundance of m/z=368.4, which is a standard fragment ion of cholesterol formed via water elimination from the molecular ion. In contrast, in standard EI the cholesterol molecular ion relative abundance is less than 50% and the relative abundance of m/z=368 is variable and can be even bigger than of the molecular ion, particularly at the peak tail due to partial intra ion source degradation on what is claimed by the vendor as "inert" ion source. Click to Enlarge. As demonstrated in Figures 4 and 5 above, the Cold EI peak shapes are fully symmetric, as originated via the GC column and without any ion source Peak Tail. Thus, Cold EI is characterized by the following peak tailing related advantages over standard EI. Improved GC separation via the elimination of peak tailing. Largely increased peak height and signal, and the harder the compound for analysis the greater is the sensitivity gain with Cold EI over standard EI. Lower noise. The elimination of peak tailing results in having lower noise and the Cold EI noise is further reduced via the elimination of vacuum background. Combined with the signal gain the obtained signal to noise ratio can be a few orders of magnitude better than in standard EI (over a factor of 100 for Cholesterol). Full elimination of any intra ion source degradation. Sample identification via library search is improved and combined with the Tal-Aviv Molecule Identifier software it is the best, compared with any other GC-MS. The range of compounds amenable for analysis is increased with Cold EI for a few reasons such as the ability to use short column and high column flow rate and in addition via the ability to analyze polar compounds such as free fatty acids without derivatization. 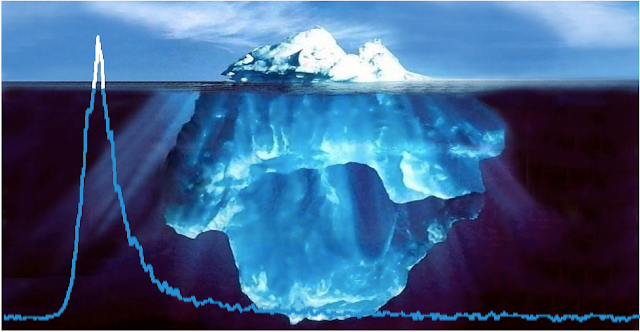 The ion source peak tailing phenomenon is far more detrimental and widely encountered than commonly perceived. The use of GC-MS with Cold EI such as the Aviv Analytical 5975-SMB fully eliminates this peak tailing hence brings major performance improvements into GC-MS.